WHAT ME & PA SAW IN THE MEADOW was shortlisted for The Bristol Prize 2013 and is in their wonderful anthology. SOURDOUGH was shortlisted for The Writers & Artists Yearbook Arvon Prize 2013 and published onsite. TEA & FRANKENSTEIN was published on the One Million Stories website and included in their best of 2011 anthology. CLARKSON WAS GOOD was short listed at the Guildford Book Festival 2010 and published in THE TRAIN IN THE NIGHT AND OTHER STORIES published by Completely Novel in 2010. 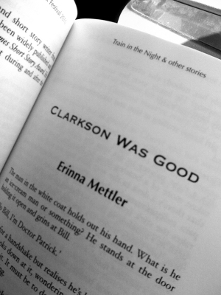 CLARKSON WAS GOOD also published in Swamp Writing,Time & Memory issue 2010. I am relatively new to poetry but a very lovely journal agreed to publish a few recently and I must say I am in excellent international company. I have collaborated with jeweller Vivienne Ridley on The Riddler Collection, combining one off items with modern fables to make a truly unique gift for every occassion. A panel discussion with Unbound authors Lulu Allison, Pierrre Hollins, myself and Editor Matthew Clayton. Everything you need to know about crowdfunding a book! I will be talking about cracking the art of short story submissions. A wonderful evening of food and book chat in the truly special setting of The Regency Town House. Together The People, Preston Park Sept 5th and 6th 2015 – The Beach Hut Writers on The Soapbox Stage on Saturday and Sunday evening. I have read at Rattle Tales many time, including once in France and three times at Brighton Fringe and at SMALL WONDER at Charleston. Underneath was read by Wordtheatre at Latitude Festival 2012 and at their Anaphylaxis benefit the week before. Both times the stories were read by Gethin Anthony (Game of Thrones) and Diana Vickers and they were a joy to listen to! My short story SOURDOUGH, about a homeless man in New York at the time of John Lennon’s death was short-listed for the Writer’s & Artists Yearbook Arvon Short Story Prize 2012 and published on their website. 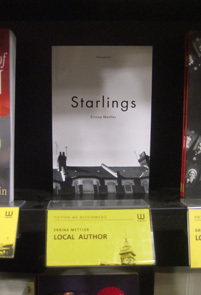 I read an extract from STARLINGS at Ace Stories Brighton on September 25th 2011 at The Pelirocco Hotel. ACE Stories commissioned a story for their charity event THE SEA at Saint Luke’s Church Hove in aid of The RNLI, the most interesting venue I have ever read at. I took part in the Hendrick’s Short Story Slam at the 2011 Brighton Fringe Festival. A terrifying and exciting experience! 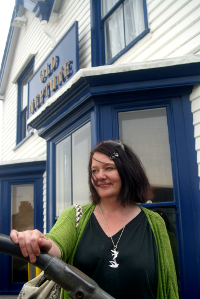 I read at The Gloobah and AC Artist’s Open Houses during the 2011 Brighton Festival and will be doing more readings this year. DALEKS was long-listed in the 2009 Fish Short Story Prize. Two of my stories SLEEPING IN A COFFIN and VIRTUOSITY have been expertly interpreted at Are You Sitting Comfortably? in Brighton. I recommend this as an experience for a writer so check out their website.